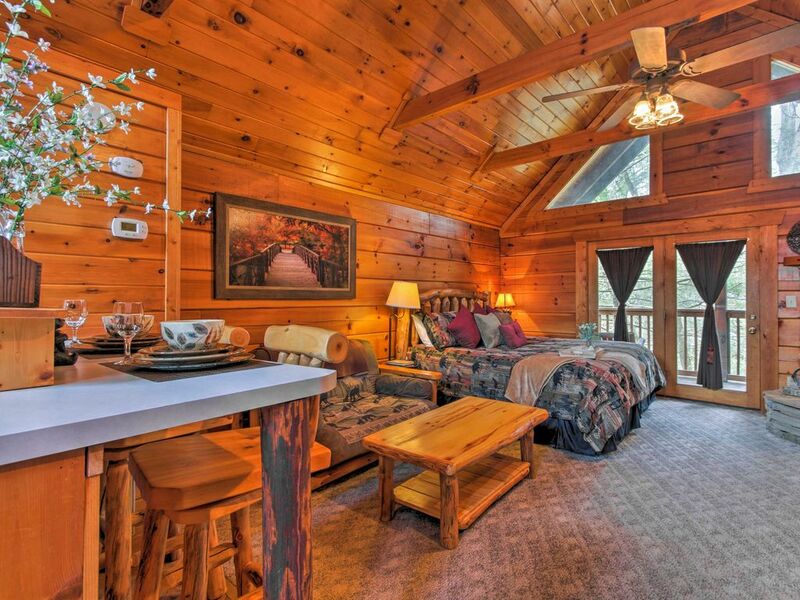 Enhance your romantic getaway to the Smoky Mountain area while staying at 'Two Hearts,' a custom-built vacation rental studio cabin in Gatlinburg. Perfect for 2, this cabin is a cozy mountain retreat featuring a 2-person hot tub and scenic views from the covered porch. Take a ride on the Sky Lift or tour the aquarium in downtown less than 10 minutes away. Entertainment in Pigeon Forge is just 25 minutes away, so put on your adventurer hat and visit Dollywood, Wonderworks, or the Titanic Museum! "Two Hearts" is a well-appointed studio cabin and your new favorite home-away-from-home in the heart of the Smoky Mountains. Pack your bags and come enjoy a memorable getaway with your travel partner! Warm wood paneling lines the interior of this single-story cabin and enhances a charming alpine atmosphere. For a quiet evening in, grab a seat on the couch to watch a new movie on the 55-inch flat-screen cable Smart TV. If you're a bookworm, you'll want to turn on the stacked stone gas fireplace so you can cozy up with a new novel. Let your mind and body relax with a long soak in the 2-person hot tub on the covered porch or in the heart-shaped jacuzzi tub. When you're feeling hungry, grab your sous chef and prepare a home-cooked meal with ease in the fully equipped kitchen. Need inspiration? Connect to the complimentary wireless internet to search for a new recipe. If you plan to hike in Smoky Mountain National Park, the king-sized bed is sure to provide you with a sound sleep no matter how long the stay. If it's a peaceful mountain retreat you're after, then 'Two Hearts' is the cabin for you! You'll even have access to the newly built community pool, picnic areas, and basketball courts while staying at this property. Take your trip to new heights when you ride the Sky Lift in downtown Gatlinburg just 10 minutes away. Ground-level activities are also available, including tours of the aquarium, the Hollywood Star Museum, and the Ole Smoky Barrelhouse. Known for its rugged ridgelines and natural beauty, Great Smoky Mountain National Park is just 10 minutes from this cabin. Stop in at the Sugarlands Visitor Center to pick up a trail map for fun-filled treks! Plan an afternoon to spend in Pigeon Forge - a Smoky Mountain entertainment mecca. Dollywood, Wonderworks, and the Pigeon Forge Gem Mine are waiting just 25 minutes north of this cabin. It was absolutely wonderful besides the fact the hot tub didn’t work. I paid a lot of money to stay here and I’m not even getting to enjoy one of the best features of the cabin....also the hot water runs out before you can even get the heart tub full. But other than that it was great me and my fiancé will definitely be going back to gatlinburg and pigeon Forge. Property was great! We loved it the only thing that was a problem was the tub inside. The water wouldn’t stay hot so we weren’t able to enjoy the lovely tub. Overall, wonderful place and a beautiful spot! I’d recommend to others! Very romantic and cozy! I was able to cuddle up with a loved one in the warm atmosphere we had to protect us from the bitter cold outside. Couldnt have asked for a better trip. And hey! I proposed to my boyfriend - He said YES! My husband and I stayed here for our anniversary! Super cute and was excited when we arrived and the inside was decorated for Christmas! Very clean and comfortable! Definitely recommend! Great location just outside the Arts and Crafts area. The cabin is just like the pictures. Great location just outside of arts and crafts area. Cabin just like picture. The only problem hot tub didn't work properly needs to be replaced. Property manager was easy to get ahold of. We would stay there again. We stayed for our anniversary and absolutely loved it. Easily accessible yet feels so far away from it all. We loved being able to relax in the jacuzzi and watch TV. Everything you need and perfect size cabin. Already planning out next mini getaway to come back. Not a deal breaker but I wish the fireplace would have worked. I had emailed through the evolve portal about the problem.